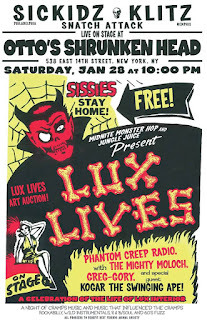 Dive headfirst into the BUCKET O’ BLOOD to return back to LUX LIVES 2017, where the teenage obsessions that are SIC KIDZ took the stage, honoring the life, love and lunacy of the wild man of rock and roll, LUX INTERIOR! Listen as they prove punk is alive and well, getting deep and dirty with the itty bitty, nitty gritty rock and roll! Listen as KOGAR THE SWINGING APE spins some tracks, along with the deadly duo of the MIDNIGHT MONSTER HOP: the malevolent maestro of the mic, THE MIGHTY MOOCH; and the silent spinner of the demented tracks on wicked wax, DJ GREG-GORY! It’s time to far out – to outer Andromeda, well beyond Jupiter and way past Uranus, buddy! If you find yourself swirling around a black hole, hitch a ride with a man from mars to get yourself to the Midnite Monster Hop on April 28 to see THE NEBULAS! The fearsome surf combo. Joining them will be THE GUILTIES! Don’t feel guilty – give in to the temptation and head to OTTO’S SHRUNKEN HEAD in NEW YORK CITY for the monthly MIDNITE MONSTER HOP! Right now, find yourself a doctor because it’s time to STAY SICK. PHANTOM CREEP RADIO IS ON. THE. SCARE!!!!!!! !